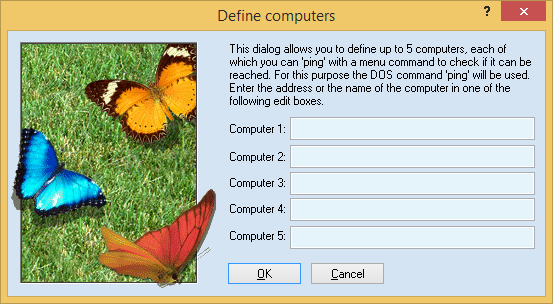 Use this dialog to define up to five computers, which you may test with the ping command later. You may enter IP addresses, such as 192.100.0.1, or computer names, such as mycomputer. When you use the ping command from the menu with such a text, a DOS command prompt with the ping command will be started. This allows you to check if the computer can be reached in the network.